Well, here we go again. I am still in the First Steps section of the Coats & Clark book, Knitting Made Easy. The first sentence under the Holding the Needles section reads, “The right needle is held as if holding a pencil.” This explanation struck me a bit odd as the way I hold my pencil doesn’t seem to be compatible with knitting. But again, who am I to question the knitting experts at Coats & Clark. I gave it a try. Actually, I gave it more than a try. 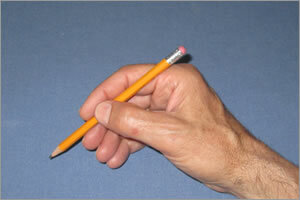 First, I studied my hand position as I held my pencil. Coats & Clark book, Knitting Made Easy book. I wound the yarn around my pinky finger, over my third finger, under my center finger and over my index finger. All this, while trying to hold my needle like a pencil. At this point, my avid knitter wife asked me what I was trying to do as if it wasn’t obvious. 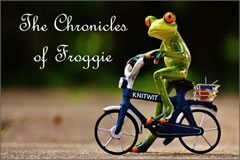 I should mention that she also gave me the spousal look as if to say, “Are you stupid, or what?” Without taking the bait, I passed her my Knitting Made Easy book and asked her if the section on Holding the Needles made sense to her. I have seen my avid knitter wife knit. She makes it look so easy. She is really good. But to the point at hand, I can see that she doesn’t hold the needle like a pencil. So what gives? 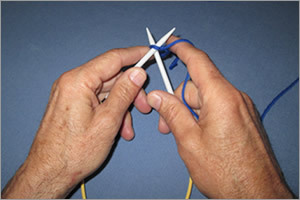 Step 1: Hold the thumb and fingers of your left hand over the needle like a tent, so that the fingers can work together. Step 2: With both the hands tented over the pointed ends of the needles, the right index finger wraps the yarn and controls the tension. What’s with the tents? I scouted in my youth, camped out often, and there is nothing about a tent that resembles what my hands look like when holding knitting needles. 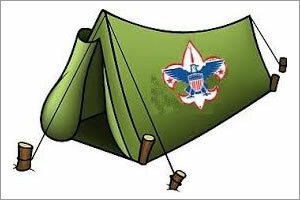 Just to be sure, I went to Google and pulled up a picture of a tent. I looked at the tent and then I looked at my hands trying to hold the two needles and yarn. No help. It wasn’t working for me. Resigned, I put the Start to Knit book away and gave my avid knitter wife my most pathetic look and asked her if she could show me and patiently explain to me without talking about pencils or tents or any other kinds of objects how to hold the needles and yarn. We actually had a good discussion and a good lesson on Holding the Needles. I could see and understand what she was doing and her explanations made sense to me and were so much better than those explanations in the books. More importantly she could see and understand my difficulty with it all. Thus far into my learning how to knit adventure, it has become quite clear to me that I can’t just get a book and do this on my own. I need a teacher. Lucky for me, I have a good one. A great one. And I am going to need to practice, to play around, to succeed and to fail, and find out what works best for me which, by the way, is just what my avid knitter wife told me in the first place. You see, I do listen to her. But now I wonder. How many folks, men, women, spouses, friends, boys and girls, etc, tried to learn to knit, perhaps bought a book or went to a knitting site, and then gave up out of sheer frustration at not understanding the terms and illustrations, not being able to get the hang of it, feeling kind of stupid, and just losing patience not to mention enthusiasm?